If you are a homeowner or a lawn care professional, you probably know by now the importance of having a durable and reliable string trimmer in 2019. A string trimmer is an essential tool if you want your lawn to look flawless. However, carrying a string trimmer can be difficult, especially if you have a large lawn or if you are a landscaper that uses the tool on a daily basis. So, how can you manicure your lawn without supporting a high level of fatigue? Fortunately, many of the outdoor power tool manufacturers invested in the production of the convenient walk behind wheeled string trimmers. Read this buyer's guide to find out if this tool is suitable for you and consult our best walk behind wheeled string trimmer reviews to choose your favorite machine. Click the links below for more detail on each model. How To Choose A Walk Behind Wheeled String Trimmer? What To Consider Before Buying A Wheeled String Trimmer? The walk behind wheeled string trimmers are powerful lawn care tools that have the aspect similar to the walk-behind push lawn mowers and the functionalities of the regular string trimmers. Being powered by more powerful engines and having wider cutting swaths, these machines are recommended not only for the professional landscapers but also for the residential users that have lawns larger than 1 acre or who have thick grass and stubborn weeds to deal with. Although these string trimmers are less versatile than the more popular whackers, they typically deliver better results on all types of grass and can be easily used on almost all terrains, regardless of the topography. Let’s see which are the main features of a walk behind wheeled string trimmer, so you can decide if it might be a good choice for you. Most of the wheeled string ﻿﻿﻿trimmers ﻿﻿﻿available on the market are gas-powered by 4-stroke engines of various capacities. The best part of these engines is that they run on gas alone, so you will not have to worry about mixing the right ratio of oil and gas. However, you will have to use the right type of lubricant or oil to ensure the well-functioning of the tool on the long-term. Because the walk behind wheeled string trimmers are powered by gas engines, the starting system is in most of the cases similar to the one used for the gas-powered walk behind lawn mowers. So you will probably have to operate a recoil starter that is actioned by pulling a rope. For some users, this might be a negative aspect. Similar to the popular whackers, the walk behind wheeled string trimmers use a string system to cut the grass and the weeds. The main difference between the two types of string trimmers is the cutting width. The wheeled string trimmers feature wide cutting swaths that can reach even 22 inches. 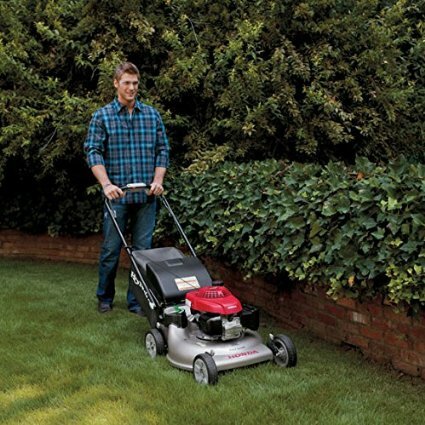 This feature makes these machines perfect for large lawns or for intensive use, reducing the overall trimming time. In addition to the cutting width, the type of line used on this machines is most of the times thicker, while the cutting heads can use up to four strings at a time for an increased efficiency. Some of the wheeled string trimmers available on the market also feature adjustable cutting heights. This feature makes these machines perfect for the use on any type of terrain, and, above all, for the use on any type of grass and weeds. Typically, the wheels of these string trimmers are made of hard plastic or another type of resistant material that can be used on multiple types of terrains. The wheels usually have diameters up to 16 inches. Depending on the type of terrain you have, you should buy a string trimmer with smaller or larger wheels. Remember that the large wheels generally have a better traction and improve the stability of the string trimmer, making the machine easier maneuverable. So, you have decided that you need a walk behind wheeled string trimmer. Good! Now, let’s see what things you should consider before deciding which model is the best for you. The first thing to consider before buying a wheeled string trimmer is the type of lawn you have. You should take into account not only the size but also the type of terrain and type of grass you have.Based on this information, you should decide the cutting width, desired height of the machine and the cutting height. Ideally, you should try and invest in a model that has an adjustable cutting height feature. However, if this is not possible, at least choose the most appropriate height for your case. Based on the type of grass and weeds, you should also choose the thickness of the cutting line.The lawn characteristics should also determine the engine’s capacity. Some of the most popular wheeled string trimmers on the market have engines between 140cc and 190cc. Ideally, you should choose a wheeled string trimmer that has an adjustable handle. The handle should also be foldable, for easier storage and transport. If you find it difficult to handle the machine, you could try and use a harness that should help you increase the maneuverability of the tool. 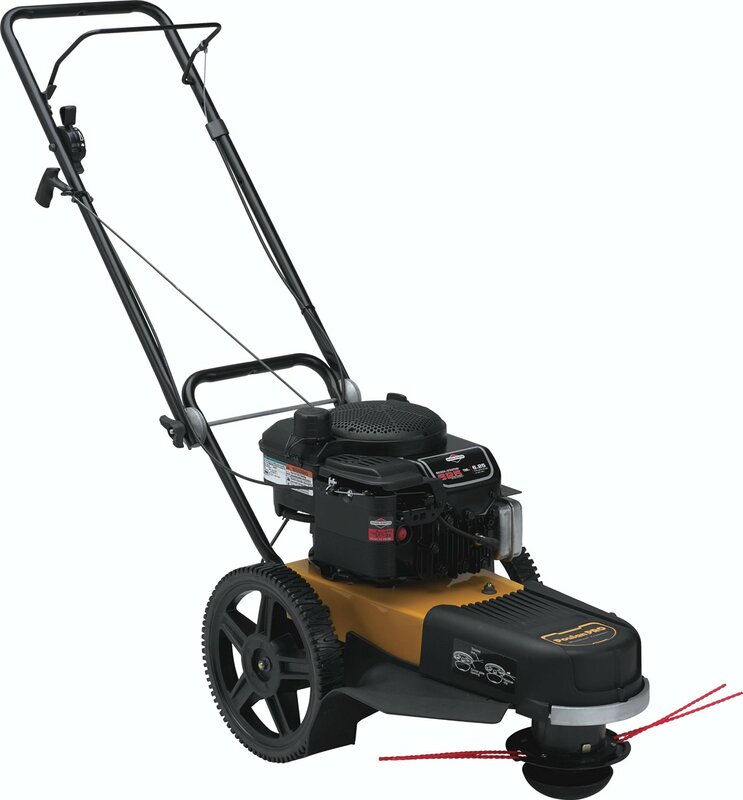 Like all the other gas-powered tools, the gas-powered walk behind wheeled string trimmers are quite annoying to use because of the high level of vibrations. To reduce this discomfort and make your tool more pleasant to use, you should choose a model provided with an anti-vibration system. Designed for large lawns and all types of terrains, the Remington trimmer and lawn mower is powered by a powerful 159cc 4-stroke MTD Powermore engine that features an OHV valve for more efficiency. With this walk behind wheeled string trimmer, you will be able to manicure your lawn in a breeze, regardless of the type of grass you have. To increase the stability and the maneuverability of this string trimmer on all types of terrain, Remington equipped this machine with large 14-inch ball bearing wheels. In this way, this string trimmer is easily maneuverable on slopes or on rough terrains. Large cutting swath: designed for commercial use and for large lawns, this wheeled string trimmer has a 22-inch cutting swath. Thick cutting line: thanks to the .155 inches line, this string trimmer cuts with ease through any type of grass and weeds. Off-set trimmer head: if you have to trim the grass in hard to reach places, this feature will allow you to do this. Folding handle: you will be able to fold the handle for easier storage and transport. Some of the plastic components seem rather cheap. Popular among many homeowners, the Poulan Pro PR22WT is another excellent walk behind wheeled string trimmer you can buy. This string trimmer is powered by a reliable 140cc Rato engine and boast a 22-inch cutting swath. The string trimmer uses a recoil starter system, being fairly easy to start for a gas-powered tool. The string trimmer comes fully assembled, so there is no hassle of putting the parts together. You will be able to start getting rid of the weeds in your lawn as soon as you get this machine. Large wheels: the 12-inch wheels are large enough to ensure an easy maneuverability on all types of terrain. Adjustable cutting head: you will be able to adjust the cutting height, which is a great feature. CARB compliant: you will be able to use this string trimmer safely, thanks to the reduced level of emissions. 2-year warranty: if you will experience any issues with this trimmer, you can take advantage of the 2-year warranty. Some users experienced issues with the throttle mechanism, which is made of plastic. Husqvarna is renowned for its reliable tools, and the manufacturer doesn’t disappoint with the HU625HWT wheeled string trimmer. 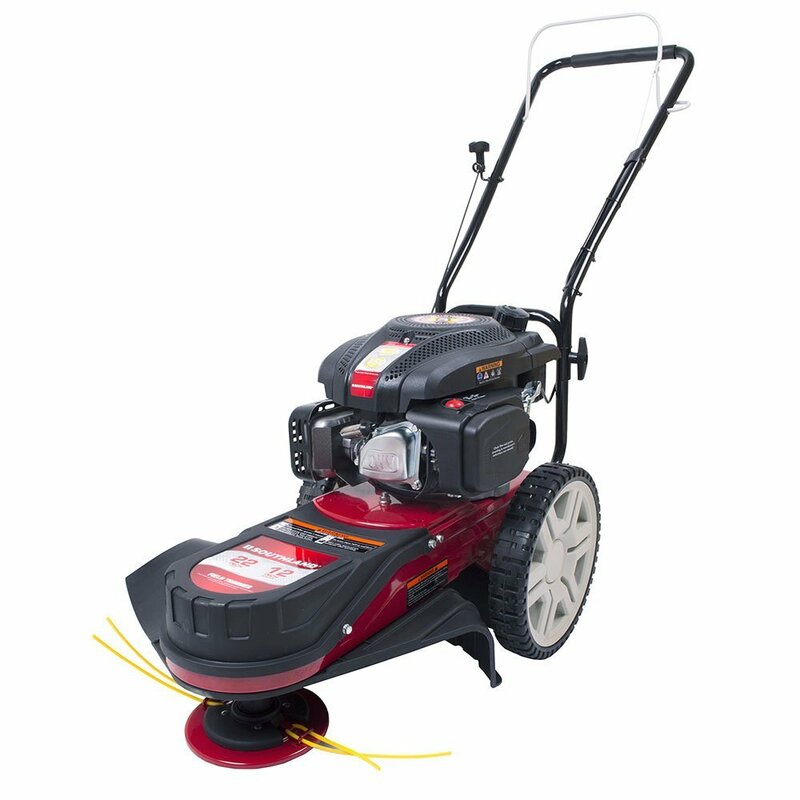 This unit is powered by a 190cc Quantum engine from Briggs & Stratton and features a 22-inch cutting swath. To make this machine as user-friendly as possible, Husqvarna equipped it with an adjustable handle that has unlimited adjustment positions. Basically, you will have the freedom to choose the height that best suits you, without preset positions. Throttle control: thanks to this feature, you will be able to adjust the cutting speed according to your needs. Adjustable cutting height: the cutting height varies from 1.6 to 3 inches. Excellent maneuverability: the 12-inch wheels make this string trimmer extremely easy to maneuver. Great cutting quality: this string trimmer uses a rotating cutting head that delivers an excellent cutting quality. Some users complained about having difficulties to start the machine. Go here to check out our extensive reviews on Husqvarna weed whackers. Designed for heavy-duty commercial use, this wheeled string trimmer is another excellent choice for all the homeowners that have large lawns. 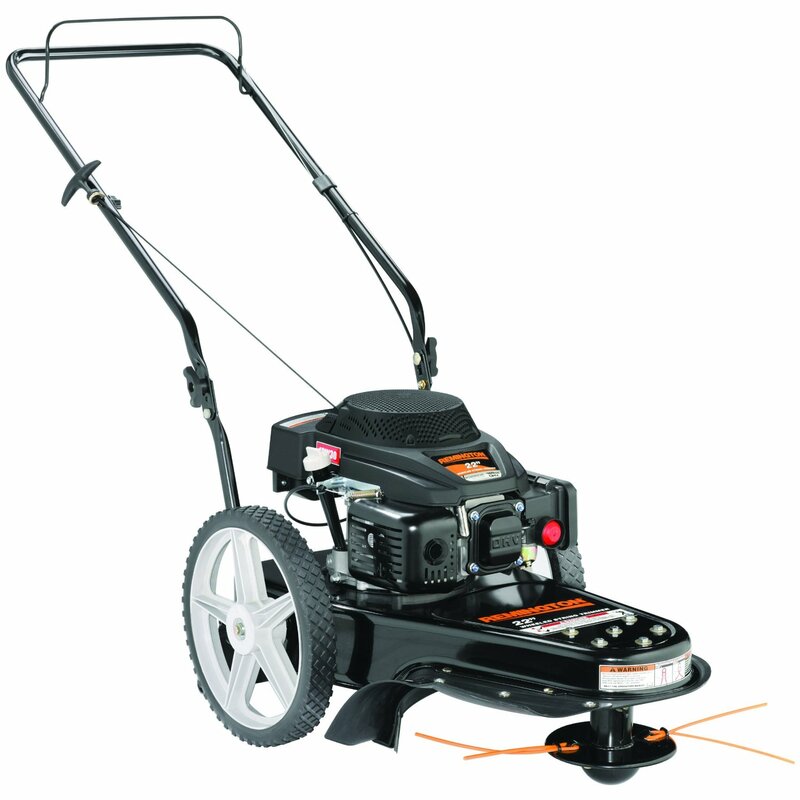 This field trimmer is powered by a 150cc 4-stroke engine and has a 22-inch cutting swath. To deliver professional results, this walk-behind wheeled string trimmer uses a professional .155 cutting line, while the extra-large 14-inch wheels ensure an easy maneuverability and excellent stability on all types of terrains. Easy to start: although this machine uses the popular recoil starter system, it is very easy to start compared with many other models. Quiet operation: according to the users, this string trimmer has a fairly quiet operation. Anti-vibration handle: the handle features a foam anti-vibration grip that will make the unit more comfortable to operate. CARB compliant: you can use this string trimmer in all the geographical areas without problems. There seem to be some problems regarding the quality of the engine’s belt. The last walk behind wheeled string trimmer reviewed is the Fields Edge’s M200 string mower. This machine is manufactured mainly for commercial use but it is highly appreciated by the residential users as well. The M200 is powered by a 173cc 4-stroke Viper engine, being able to cut with ease through any type of grass and weeds. In addition, the 14-inch wheels increase the stability and maneuverability of the tool on all types of terrains. Quick-start: this string trimmer is equipped with a Quick-Start Primer, being really easy to start. Foldable handle: in addition to being adjustable in height, the handle of the M200 is completely foldable for easier transport and storage. Adjustable cutting height: you will be able to choose the desired cutting height between 0.15 and 3 inches. 5-year warranty: this wheeled string trimmer features one of the longest warranties on the market, boasting a 5-year warranty for both the trimmer and the engine. Compared to the other walk behind wheeled string trimmers reviewed, this one is rather expensive. Even if there are many walk behind wheeled string trimmers to choose from, I really like the characteristics and performance of the Husqvarna HU625HWT 190cc High Wheel Trimmer. The powerful engine will provide sufficient energy even in the most demanding situations. The incredible maneuverability is another big plus of this machine and the throttle control will allow you to adjust the cutting speed based on the characteristics of your lawn. Another great feature is the possibility to adjust the cutting height, while the rotating cutting head delivers impressive results on all types of grass and weeds. For all these reasons, I believe that the Husqvarna HU625HWT 190cc High Wheel Trimmer is the best walk behind wheeled string trimmer available on the market. If you're looking for other types of string trimmers, make sure you visit our best string trimmers to get an idea for what other types of models are out there.